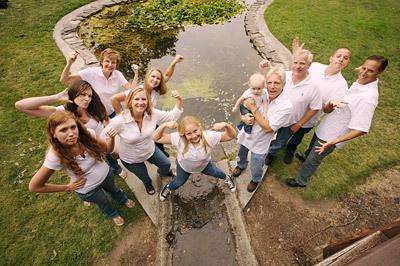 The two key components to great group shots are composition and lighting. Start with lighting. You could position everyone in the bright sun, snap a frame or two, and move on. But I doubt that your subjects will be thrilled with the results. Harsh direct illumination creates unflattering shadows and high contrast. Diffused, even illumination will help everyone in the shot look their best. I often schedule group shots for early or late in the day to take best advantage of sweet light. Slightly overcast days are a blessing because nature creates a giant softbox in the sky for you. If conditions are less than ideal, use open shade from a tree or patio, then turn on your flash letting it serve as a fill light. Keep in mind, however, that you have to stay within the range of your flash, which is usually about 8 feet. When composing the shot, position your subjects as close together as possible. People tend to stand too far apart, and this space between them is accentuated by the camera. I'll often position some of the subjects at a 45 degree angle to the camera. This creates variety in the composition and enables them to stand closer to others in the group. Before you snap the shutter, check everyone's hair and clothing to make sure nothing is out of place, then ask, "Can you see the camera? If you can't see the camera, it can't see you." Reposition as necessary. Once you have a group shot you like, ask folks if they have a few more minutes for something fun. You can let them strike poses, lean against one another, try interesting angles such as you shooting up at them, or anything else that comes to mind. Often this will be the shot that they like the best, and it ends the session on an upbeat note.